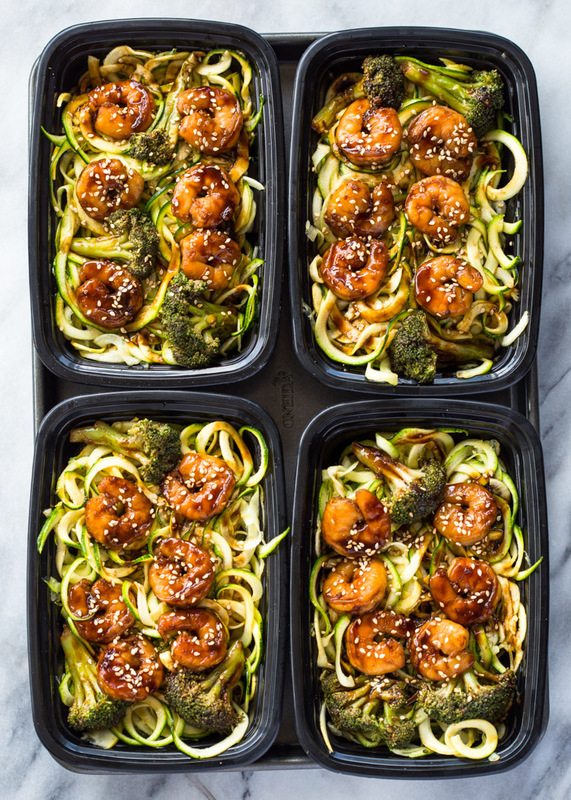 Zucchini noodles topped with Teriyaki shrimp and broccoli. 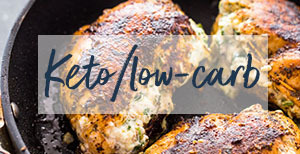 This flavorful low-carb dish meal prep comes together in under 30 minutes and makes a healthy week-day lunch at just 174 calories per meal! 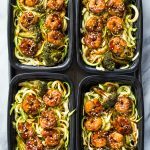 This super delicious and flavor packed meal prep teriyaki shrimp and zucchini noodles (aka zoodles) recipe is for all my low-carb readers and anyone else who wants to eat healthier. 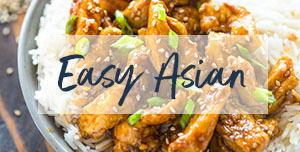 The shrimp teriyaki and broccoli are first cooked in a simple home-made teriyaki sauce that comes together in just a few minutes. 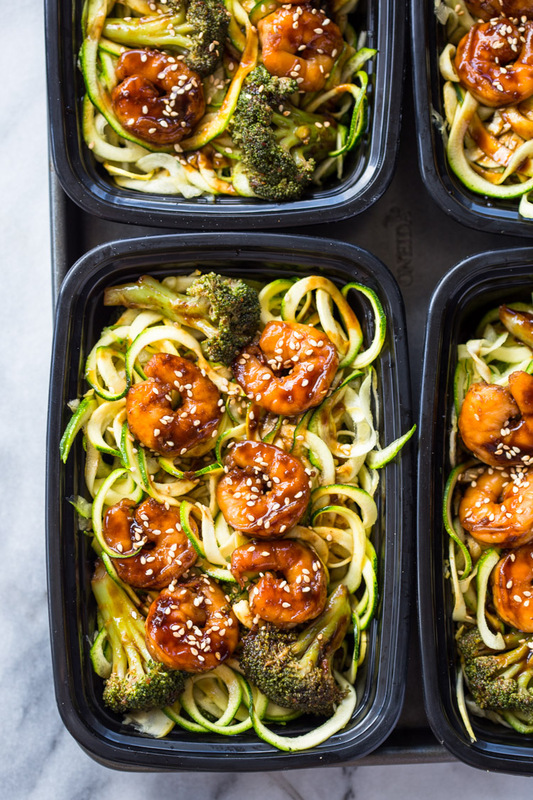 After the shrimp and broccoli are cooked in the sauce, they are removed from the pan and the zucchini noodles are then tossed in the pan just to soak up all the flavors left in the pan. 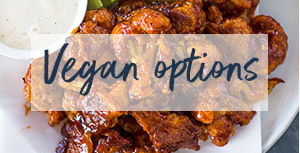 You don’t want to over-cook them or they will wilt and become hard to manage. If you don’t have a spiralizer you can use a regular or Julienne peeler or just cut super thin strips with a knife, but I highly suggest you get yourself one of these handy little spiralizers. They will make it so much easier to spiralize any veggie and eat healthily. Heat a large skillet over medium high heat. Add oil and shrimp and cook for 2-3 minutes per side or until pink. Remove shrimp from pan and add 1/4 cup water, soy sauce, honey, garlic, sesame oil, and ginger and whisk to combine. Bring mixture to a boil. In a small bowl whisk together cornstarch and remaining 1/4 cup water. Slowly whisk in the cornstarch mixture into the saucepan and simmer for 3-4 minutes or until thick. Return shrimp to pan along with 1 cup of blanched broccoli and coat evenly with sauce. 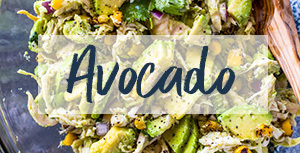 Remove from shrimp and broccoli from the pan and toss in the zucchini noodles just until coated with the sauce, if the zoodles are too much, add to the pan in batches. Divide zoodles into 4 or more meal-prep containers. 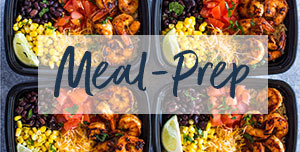 Top each container with shrimp and broccoli. 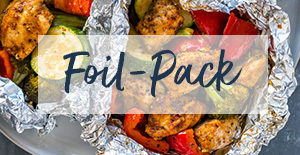 Cover and refrigerate for up to 4 days. 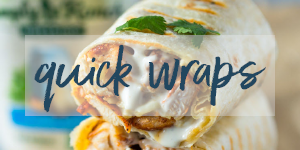 To heat, microwave for 1-2 minutes or until steaming. 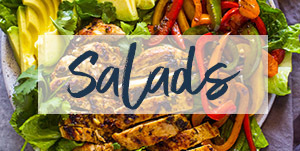 Do you have a link for a printable recipe?